At the AWS re:Invent event, Amazon Web Services, Inc. (AWS), an Amazon.com company (NASDAQ:AMZN), announced AWS Ground Station, a new service that makes it easy and cost-effective for customers to download data from satellites into AWS Global Infrastructure Regions using a fully managed network of 12 ground station antennas located around the world. Once customers receive satellite data at a ground station, they can immediately process it in an Amazon Elastic Compute Cloud (Amazon EC2) instance, store it in Amazon Simple Storage Service (S3), apply AWS analytics and machine learning services to gain insights, and use Amazon’s network to move the data to other regions and processing facilities. Getting started with AWS Ground Station takes just a few clicks in the AWS Management Console to schedule antenna access time and launch an Amazon EC2 instance to communicate with the satellite. There are no up-front payments or long-term commitments, no ground infrastructure to build or manage, and customers pay-by-the-minute for antenna access time used. To get started with AWS Ground Station, visit https://aws.amazon.com/ground-station. Satellites are being used by more and more businesses, universities, and governments for a variety of applications, including weather forecasting, surface imaging, and communications. To do this today, customers must build or lease ground antennas to communicate with the satellites. This is a significant undertaking and cost because customers often require antennas in multiple countries to download data when and where they need it without waiting for the satellite to pass over a desired location. And the antennas are just the beginning of the infrastructure requirements because customers need servers, storage, and networking in close proximity to the antenna to process, store, and transport the data from the satellite. And then customers must build business rules and workflows to organize, structure, and route the data to employees or customers before it can be used to deliver insight. All of this requires significant capital investments and operational costs to build, manage, and maintain antennas, compute infrastructure, and business logic at each antenna location. AWS Ground Station allows customers to more easily and cost-effectively control satellite operations, ingest satellite data, and integrate the data with applications and other cloud services running in AWS. Using AWS Ground Station, customers can save up to 80 percent of their ground station costs by paying for antenna access time on demand, and they can rely on AWS Ground Station’s global footprint of ground stations to downlink data when and where they need it. The recency of data is particularly critical when it comes to tracking and acting upon fast-moving conditions on the ground. This timeliness depends on frequent communications between ground stations and satellites, which can only be achieved with a large, global footprint of antennas maintaining frequent contact with orbiting satellites. For example, as fast-moving environmental, geopolitical, or news events unfold on the ground, AWS Ground Station customers can downlink current data to any of the 12 AWS ground stations around the world and quickly combine the data with other AWS services to process, store, analyze, and transport the data to keep up with rapidly evolving conditions. With AWS and AWS Ground Station, customers can get timely data sooner, rapidly experiment with new applications, and deliver products to market faster without buying, leasing, or maintaining complex and expensive infrastructure. AWS Ground Station’s self-service graphical interface makes it easy to identify antenna locations and communications windows, and schedule antenna time. This enables customers to review confirmed times in the console and cancel or reschedule prior to the scheduled contact time. Because many AWS Ground Station antennas are co-located with AWS Regions, customers have low-latency, local access to other AWS services to process and store this data. For example, they can use Amazon EC2 to control satellites and downlink data, store and share the data in Amazon Elastic Block Store (Amazon EBS), Amazon Elastic File System (Amazon EFS), or Amazon S3, use Amazon Virtual Private Cloud (Amazon VPC) for secure communications between Amazon EC2 instances and the AWS Ground Station antenna gateway, hunt for real-time business insights with Amazon Kinesis Data Streams and Amazon Elastic Map Reduce, apply machine learning algorithms and models with Amazon SageMaker, add image analysis with Amazon Rekognition, and improve data sets by combining satellite data with IoT sensor data from AWS IoT Greengrass. AWS customers can combine these capabilities to build exciting applications that might use image recognition to identify and protect endangered animals, machine learning to predict faulty construction or industrial systems, or analytics to estimate oil production or assess agriculture yields in real time. Charlie Bell, SVP of AWS, said that satellite data is incredibly useful for building a wide range of important applications, but it is super complex and expensive to build and operate the infrastructure needed to do so. A few years back our customers asked us if we could remove that cost and complexity, and the more we thought about it, the more we realized that AWS with its global footprint was uniquely positioned to solve this challenge. Today, the company is giving satellite customers the ability to dynamically scale their ground station antenna use based on actual need. And, they will be able to ingest data straight into AWS, where they can securely store, analyze, and transmit products to their customers without needing to worry about building all of the infrastructure themselves. Jeff Culwell, COO, DigitalGlobe, noted that the company employs AWS Ground Station to augment the capabilities of the firm's global network of ground station antennas. With greater connectivity to DigitalGlobe’s high-resolution constellation and more downlink capacity, the firm's collection planning teams can now optimize the interval from planning to image collection, downlink, and analysis — especially valuable when time matters. Partnering with the AWS team to help form AWS Ground Station has also opened exciting business innovations for DigitalGlobe and the company's customers. The task of streaming DigitalGlobe’s industry-leading satellite imagery from space to our Geospatial Big Data platform (GBDX) for industry-leading applications such as AWS-native machine learning analysis has been simplified, while at the same time eliminating multiple process steps, saving money and providing timely actionable information for customers to make decisions with confidence. Nick Merski, VP of Space Operations, BlackSky/Spaceflight Industries, added that the company’s global monitoring and alerting services provide an easy, affordable way to observe, analyze, and act on timely and relevant insights about the planet. Working with AWS to incorporate the AWS Ground Station product into the firm's ground architecture has provided BlackSky with a new view into AWS innovation. AWS listened to the company's inputs on price point and took into account the firm's needs to influence the timing and approach to their service baseline. 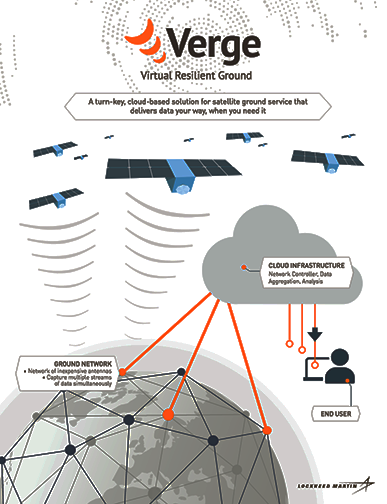 AWS Ground Station provides important growth and scalability for a global, self-service ground station-as-a-service. This product seamlessly integrates with our AWS hosted architecture, enhancing BlackSky’s ability to deliver an unprecedented level of service to customers. Jeroen Cappaert, CTO & Co-Founder, Spire Global Inc., commented that the company is a space to cloud analytics company that uses proprietary satellite data and algorithms to provide maritime, aviation, and weather tracking. The firm is excited to see AWS enter the space services market with the new and game-changing ground station services approach of AWS Ground Station. The world’s weather, ships, and planes don’t wait for Spire Global to down-link data so a diverse global footprint is key. The prospect of using AWS Ground Station to quickly scale the depth of the ground station network on the fly gives the firm more time to focus on delivering product to customers. Providing machine learning based technologies like ship location prediction and advanced weather data require intense scalable data processing and storage. By giving ground stations direct access to AWS, Spire Global can build on the ways in which we already leverage cloud services for our compute and processing needs. Additionally, AWS and Lockheed Martin are bringing these capable systems together to provide a solution that addresses customer needs for resilient satellite uplinks and downlinks. Immediate and continuous access to the latest satellite data is critical in use cases such as public safety, military missions in fast-evolving threat environments, and real-time weather observations for cargo ships and airlines. Today, there are thousands of satellites orbiting the earth and collecting data, including Low Earth Orbit (LEO) satellites, which are ideal for collecting data for Earth Observation and currently comprise about 63 percent of the active satellites now in orbit, according to United Nations data. Traditionally, government organizations or enterprises who have required access to satellite data needed to build or lease ground antennas to communicate with the satellites at significant cost and effort. Further, customers often require antennas in multiple countries and U.S. locations to download data when and where they need it without waiting for the satellite to pass over a desired location. All of this requires significant capital investments and operational costs to build, manage, and maintain antennas, compute infrastructure, and business logic at each antenna location. By combining Lockheed Martin’s distributed network of satellite receivers with direct AWS Ground Station access, the two companies are delivering a next-generation space solution that will help address the growing need for satellite ground communications and data management while reducing capacity constraints and enabling satellite customers to scale their satellite data downlinks in real-time to meet unanticipated demand across a broad variety of situations. Customers can easily request Lockheed Martin Verge as their preferred downlink directly through the AWS Ground Station console or from the Verge management console. Once Lockheed Martin Verge receives and processes satellite data, customers can access it directly in their virtual private cloud (VPC) in AWS Regions. For AWS customers in the government or regulated industries, this includes the AWS GovCloud and Secret Regions that carry the full range of data classifications, including Unclassified, Sensitive, Secret, and Top Secret. General availability and expansion to the higher frequency X-band will be announced in the future. Rick Ambrose, EVP of Lockheed Martin Space, said that, together, AWS and Lockheed Martin are providing satellite operators increased flexibility, resiliency, and scale in a complete connectivity solution, ground architecture, and cloud environment for integrated satellite and data management operations. This collaboration with AWS allows the company to deliver robust ground communications that will unlock new benefits for environmental research, scientific studies, security operations, and real-time news media. In time, with satellites built to take full advantage of the distributed Verge network, AWS and Lockheed Martin expect to see customers develop surprising new capabilities using the service. Teresa Carlson, VP, Worldwide Public Sector for AWS, said that AWS and Lockheed Martin have a long, deep relationship and over the past several years it’s become apparent that together the companies could bring greater capabilities to public sector and commercial customers. The next step in this relationship has now been taken. The integration of AWS Ground Station with Lockheed Martin Verge brings the unique capabilities of both companies to mutual customers, enabling them to control satellites across both networks and downlink data faster with more resiliency.